Two weeks ago, Jon and I revisited Hibiscus to celebrate my birthday. 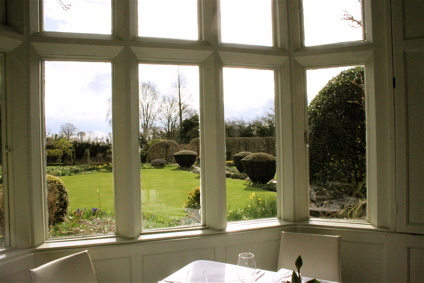 (We were last there in December 2007, soon after Hibiscus arrived in London, and I was reminded of how long it had been since our last visit when I read Tamarind & Thyme’s rave review of her lunch there in December 2009.). I’d had a horrible day at work and was tempted to cancel our 9 pm reservation. But if you cancel at the last minute, you pay a hefty £75 per person fee, which is understandable, but painful when you’re so exhausted. So I dragged myself there, and things got off to a bad start when Jon and I were wedged between two tables of men talking dealspeak. Despite my best effort to tune them out, words like “clawback” and “leverage” kept intruding, and I started to feel quite sorry for myself. 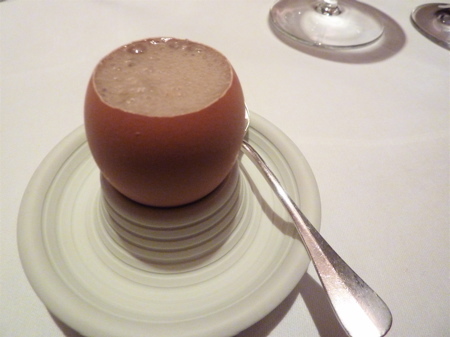 A delicious amuse of Moroccan-spiced-froth-in-an-eggshell came and went, as did hot puffs of cheese gougeres. I hardly paid attention, because I couldn’t believe I’d been wedged in Dealmaker Hell. The hazards of eating at a 2-Michelin-starred resto on a Thursday, perhaps. So I did something I’ve never done before: I asked to be moved. Our servers didn’t ask why – they just moved us. Our new table was an oasis of calm. Much better. Jon and I had the tasting menu. If I had to generalize, I’d say the courses at the start were more creative and “ooh ahhh” than the ones towards the end, but from start to finish, we had a delicious meal. My initial feeling that I had been coerced by the high cancellation fee into eating an exhaustingly-long meal was quickly replaced by the joy that a well-run restaurant with a creative, talented chef brings. 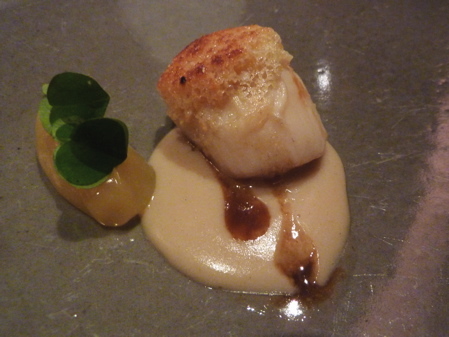 Our scallop starter with a starchy puree and refreshingly tart gelee had us wondering in awe how anyone (i.e., the chef) can think to combine such startling flavors. Because it was my birthday, I just sat back and enjoyed the ride, so if you’re looking for precise ingredient descriptions, stop reading now. One dish that still stands out, even two weeks later, was a raviolo stuffed with a poached egg, potato puree and studded with black truffle. First, the technical wizardry . 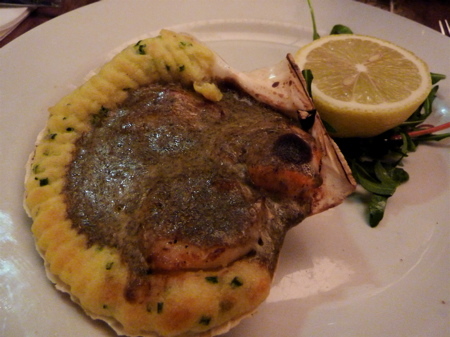 . . how do you get an egg yolk into a raviolo without the whole thing spilling out? (My photo shows the yolk after I’d poked open my raviolo). 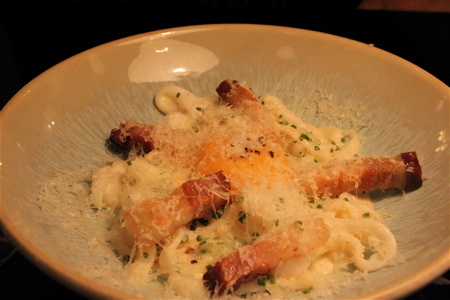 Second, the flavors – potato, egg yolk and black truffle – an understandably-classic combo. 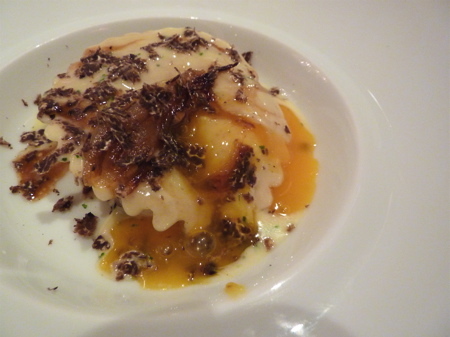 The pungent black truffle’s flavors are absorbed into the yolk and potato puree. Comforting flavors in an elegant package. Brilliant. 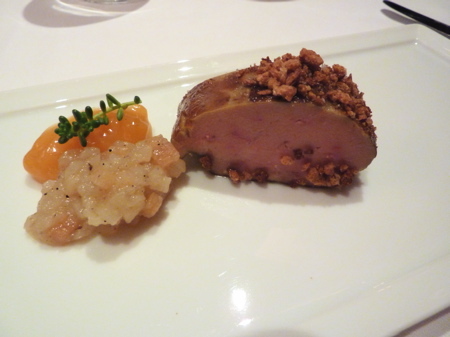 If pressed to identify a weak link, I’d single out the duck course, because the duck breast had a few tough-to-chew bits. You know, the kind you chew for a while and then end up trying to gracefully spit out because it just won’t go down. It was an odd problem to have a 2-starred place, which is the only reason I remember it. 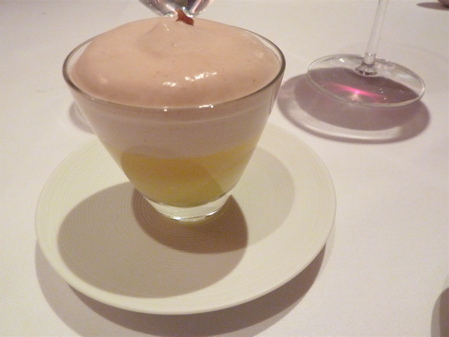 Pre-dessert, an apple gelee, celeriac and chestnut parfait was interesting but not anything I’d ever crave. The chestnut layer was too starchy for the parfait to be refreshing. Desert was tasty and playful and ended our dinner on a high note: a parsnip tart that looked just like a tarte au citron, but instead was wonderfully sweet and salty. The smoked caramel-vanilla ice cream was a dreamy accompaniment. 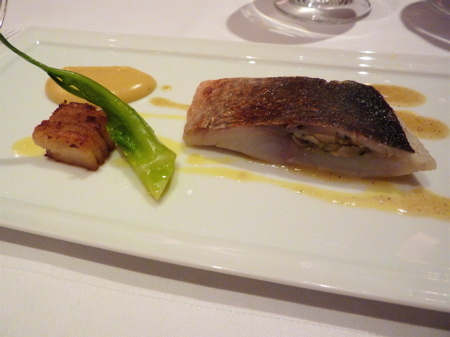 The dinner tasting menu at Hibiscus is £90, so with a modest wine, coffee and service, our tab totaled about £280. Definitely a special occasion-kind-of-place, and at these prices and after such an inauspicious start, it’s a wonder that Jon and I left the restaurant feeling happy and relaxed. Thank God we’d moved tables with no fuss. I was glad we’d revisited, and we’d be glad to go back. A few weeks ago, I’d read on Eat Noodles Love Noodles (an excellent blog written by “Mr. Noodles”) that Keelung restaurant (which I’d enjoyed despite its drubbing by the pros) had reinvented itself as a Szechuan restaurant called the Empress of Sichuan. On the strength of Mr. Noodles’s post, Jon and I had dinner there at the end of January, and while some dishes (dan dan noodles, for example) were eh, a few were good enough that we returned this past weekend to celebrate Chinese New Year with six friends. 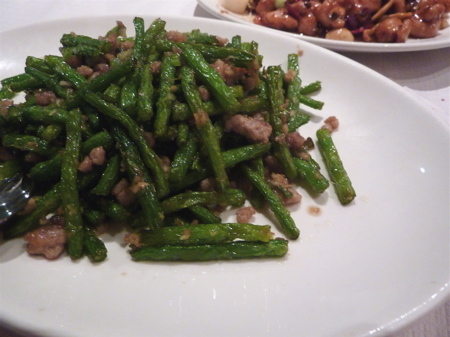 The green beans were sweet and crunchy, and the preserved veg and minced pork added salty richness. Beef slices were tender (the magic of corn flour) and fragrant thanks to the citrusy heat of Sichuan peppercorn. 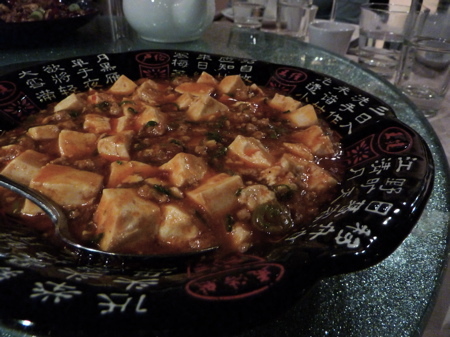 Ma po tofu at first glance looked over-starched and gloppy, but in fact tasted wonderfully silky and spicy. 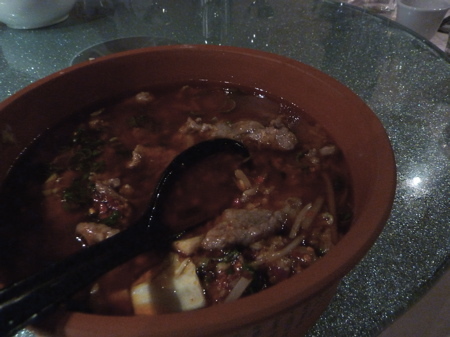 Spicy glass noodles with mince pork and dried shrimp (£8.80), more memorably known as “ants climbing up a tree” rounded out the best of the classics, and I especially liked how the dish was hidden away in the “vegetable dishes” section of the menu. Minced pork is definitely my kind of vegetable. My favorite dish of the evening was the “steamed Dong Po pig’s joint.” Pork belly lovers among you will adore this dish. 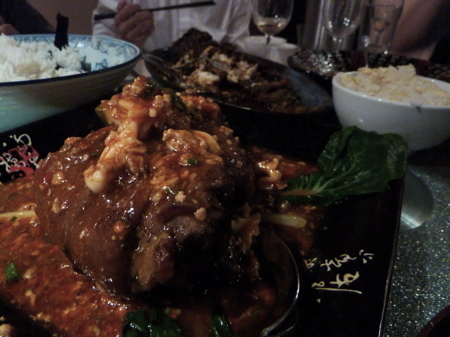 The thick layer of pig fat surrounding the knuckle was steamed and braised into unctuous, gooey silkiness. Slather the stuff over your rice. There’s some meat in there, but the fat is the main attraction. 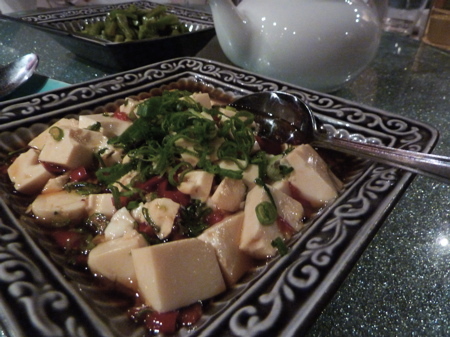 In sharp contrast to the pork joint, the chilled tofu with spring onion (pictured at the top of this post) was, for me, also a highlight of the evening. Lightly seasoned with sesame oil, soy sauce and chili, the dish was a refreshing start to the dinner. 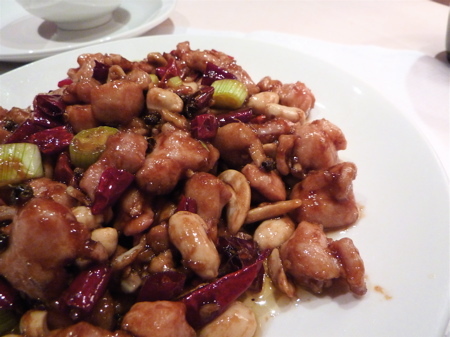 The kung pao chicken had a well-balanced sweet-spicy-salty flavor, but it needed more peanuts. And I’m against the presence of cashews in the dish. 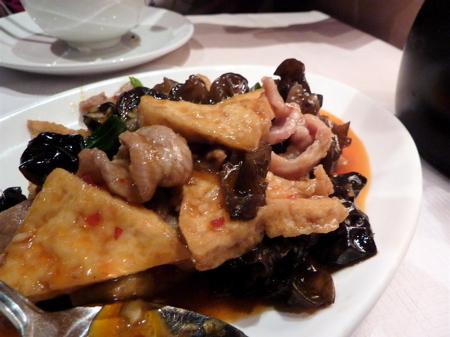 “Bear’s paw tofu,” much praised by The Evening Standard‘s Fay Maschler and The Times’s Giles Coren, turne out to be a braised tofu served with some tender slices of pork and flavorless black mushrooms. It wasn’t bad, but it was a bit bland and relatively unexciting. Grilled lamb skewers Sichuan style at £1.50 per skewer were a little too salty and over-marinated, so I’ll stick with the cumin-dusted, smoky ones served at My Old Place and Gourmet San. “Lantern shadow beef, thinly sliced beef in spicy sauce (£7) tasted like overly-sugary beef jerky, and the “farmer’s fish” baked fish with onion, cumin and black bean (£21.50) lacked enough flesh to feed the eight of us. 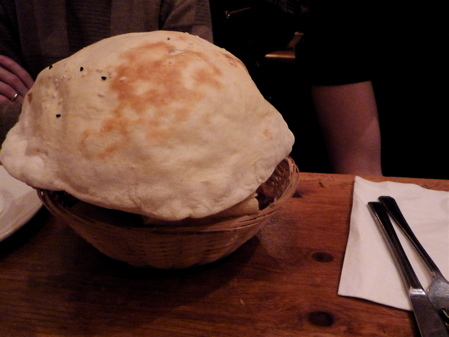 It didn’t help that it arrived at our table looking like a dark, sinister sea monster, and “baked” seemed an inaccurate description. The fish tasted fried. Maybe it was baked in a vat of oil? White rice at £2 a portion seemed expensive, but our tab without alcohol would have been only £15 a person, so I can’t complain much. With lots of wine and beer, our total became a still-reasonable £28 a person. Bottom line: the place is a winner. As my friend P pointed out: it’s a huge compliment to the restaurant that each of us at our table of eight, when asked what our favorite dish of the evening was, chose different dishes. Much as I love living near Angel, I must admit that the local restaurant scene often disappoints. 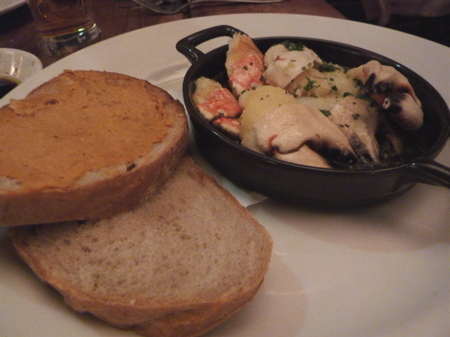 So imagine my surprise when, two weeks ago, we re-visited Gem and enjoyed the food immensely? I like it so much that I went back again last night, and now I think it’s the perfect place to go when you can’t be bothered to cook. After all, it’s cheap, it’s filling, the food’s pretty tasty, and you never need to book in advance. Years ago, Jon and I had been to Gem before, and my overall impression during that visit was of eating in a dark cave. As I recall, the place’s decor used to consist of dark wood with lots of hulking farm implements suspended from the ceiling. Oh, and there used to be what appeared to be a large stone firepit in the back. In short, the place was kind of scary. But Gem’s all different now. The farm implements are still hanging around, but they seem cheery and rustic, rather than huge and scary. 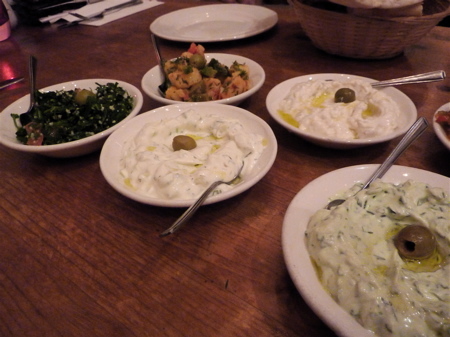 And the food – particularly the meze – are great. I’ve opted for Menu B both times recently, which includes bread, 7 cold and 3 hot meze, any main course from the menu, and a dessert. It’s a ton of food for GBP 11.95, and frankly, I’ve been overwhelmed both times I’ve ordered it and had to take some food home. (You’d think I’d learn). Fried goodies were standouts. 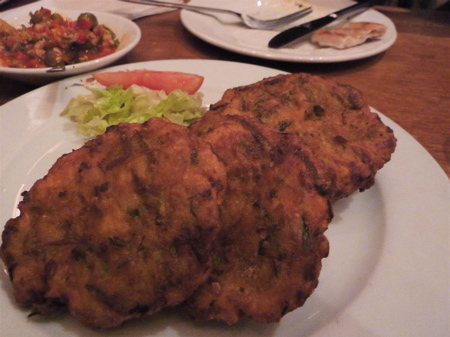 Mucver, which are vegetable fritters with a slight cheesy tang, could have used a bit more vegetable, but otherwise, they’re hot and crispy, making them the perfect comfort food on a cold winter’s night. 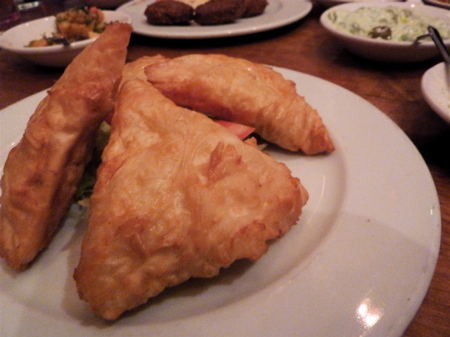 Muska boregi, feta cheese inside a crisp, fried pastry shell. What’s not to love? 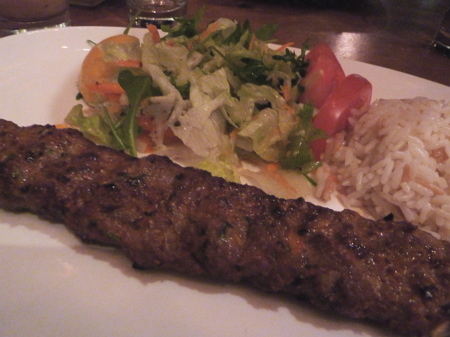 After all that delicious and filling meze, the main courses were superfluous. That said, my main course of beyti (which I couldn’t really distinguish from the “kofte” I’ve had at other Turkish grills) was moist and meaty, and I was glad to take the leftovers home with me. Next time, I’ll order “Menu C,” think, because it’s “just” 7 cold and 6 hot meze. I’m hoping it’ll be the right amount of food. Not that it’s so awful having leftovers for home. There are very few things I miss about working in Canary Wharf, and lunch at the Gun is one of them. So two Fridays ago, when our friends suggested we meet for dinner at the Well, whose owners also own the Gun, I was thrilled. A quick glance at TimeOut’s review of the Well revealed that the Well was running a 50% off food promotion, which sweetened the deal. Several of the tables at the Well (including ours) are extremely close to the door. Which means it’s cold what with all that traffic in and out. But the place was lively, and pints with good friends have a way of warming you up. The food, though, was worthwhile once we took 50% off the menu price. At menu prices (starters at around £8 or £9 and mains were £15 to £20), the Well strikes me as too expensive for the quality. I appreciate how, once you get the discount, it’s tough to imagine paying double what you did, but my roasted scallops, for example, weren’t great and weren’t awful, either. How do you put a price on that? £4.50 seemed alright for this level of cooking, but at £9, I’d be upset. 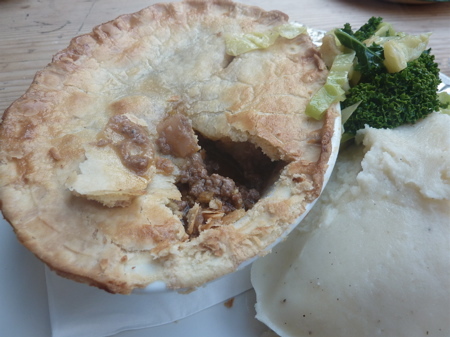 My rabbit pie was similarly alright. The filling was more soupy than I like, and I had to dig around to find the bits of rabbit, so again, at £7.50, I’m tolerant, and at £15, I’m outraged. 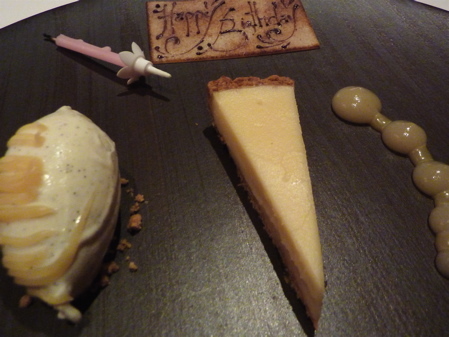 For starters, mains, shared desserts and drinks, we paid £31 a person, which felt fair. And if the food hadn’t been 50% off, I would’ve felt ripped off. The Well may share owners with the Gun, but I think that’s about all they have in common, as I recall the Gun being pricey, but worth the price. Which is all to say: go to the Well only for drinks with friends, or if you can get the 50% off food deal. Yesterday, Jon and I moved from the Barnsbury side of Upper Street to the Saint Peter’s side. Although the two areas are only a 10-minute walk apart, Upper Street might as well be the Great Wall, because in the 4 1/2 years we’ve lived in Islington, we very rarely crossed that divide. Jon and I have spent weeks packing in preparation. For two foreigners, we seem to have a lot of “stuff” with us – the American Way, perhaps. Our movers (the amazingly-strong, polite and prompt Aussie Man & Van) arrived at 8 am, and by 2:30 pm all our boxes and furniture had been unloaded in our new place. Drowning in a sea of boxes and bubble wrap and not sure what to unpack first, we decided to go for lunch at our new local, the Duke of Cambridge Pub. Although it was late for lunch, the pub’s tables were packed. Jon and I found a table in the pub’s skylighted annex and ordered off the blackboard in the back. Despite having been to the Duke of Cambridge once before in March 2009, I’d forgotten that (1) the place is all-organic; and (2) the prices are high. 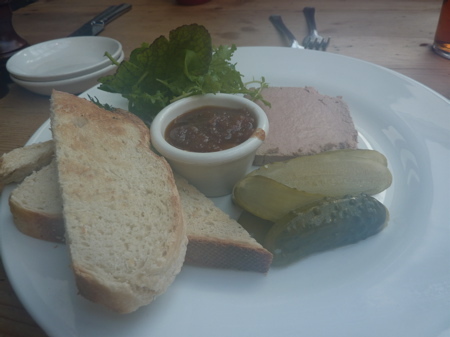 Chicken liver pate with chutney and gherkins, for example, was deliciously creamy — as chicken liver tends to be — but a rather expensive £8+. I know it’s organic, but chicken liver is supposed to be one of the cheaper ingredients in the world, no? My beef mince pie was delicious and tasted made-from-scratch. 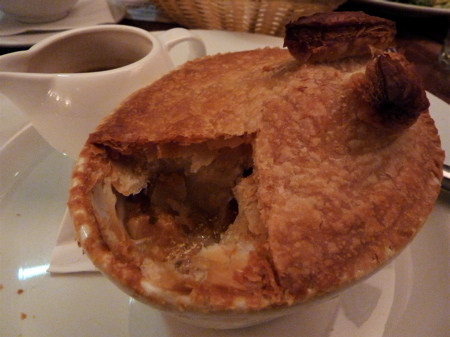 The crust shattered at the tap of my fork, and I liked that the pie filling was neither too runny nor too thick. In fact, the gravy tasted like the result of a long braise. Jon’s fish and chips was similarly well-prepared and flavorsome, though I wondered what was up with the oven-baked chips. Can they still be called chips if they’re not fried? Service was friendly; tap water not a problem; and the food was pretty good. The place has all the makings of a fine local — except for the price. At £45 for a starter, two mains and a pint, our lunch at the Duke of Cambridge was too expensive for it to be a regular habit. Luckily, this side of Upper Street appears to be packed with pubs, so we’re looking forward to exploring the other local options. Recommendations warmly welcomed! Duke of Cambridge Pub, 30 St. Peter’s Street, N1 8JT; closest tube station: Angel. Ironically, one of the greatest things about living in London is how easy it is to leave the country. From January to December last year, I traveled to New York, the Ribera del Duero in Spain, Madrid, New York again, Barcelona, Paris, Istanbul, Paris a second time, the Loire Valley in France, Paris a third time, Los Angeles, San Diego, Provence, Paris a fourth time, Munich, New York again, Boston and Palm Beach, Florida. 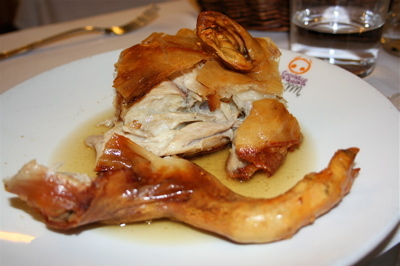 Restaurant Jose Maria in Segovia, Spain knows how to serve a roast suckling pig (cochinillo). The piglets are days old, and the restaurant prepares the crackling so perfectly that the servers divide up your cochinillo using nothing but a plate edge. It’s fun to watch, but eating the pig is the main attraction. This is how it’s done. 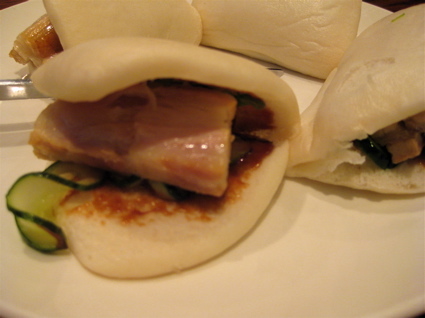 Pork bun sandwiches at Momofuku Ssam Bar in New York. Pork has never tasted so melt-in-your mouth. 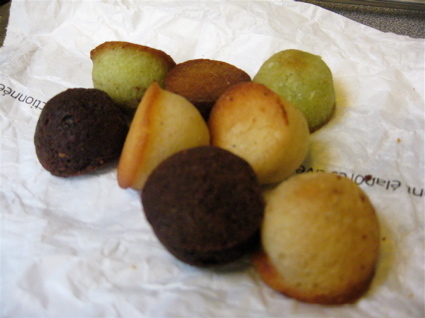 Maison Eric Kayser’s mini-financiers are nutty and sweet with a moist, chewy center. Buy a bag because they make the perfect walking-around snack in Paris. Unlike les macarons, financiers aren’t easily crushed, and mini-anything is always extra appealing, no? Bar Mut’s carpaccio huevos fritos speaks to breakfast lovers everywhere. Crispy shoestring potatoes + hot, gooey egg yolk = match made in heaven. 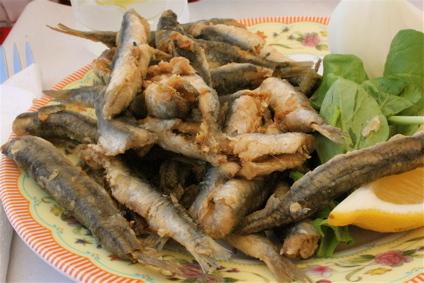 I ate so many delicious and memorable meals in Istanbul that it’s hard to pick just one dish, but if pressed, I’d name the fried anchovies at divey outdoor restaurant Furran Balikcilik, located in the Karakoy fish market. I don’t recall eating fresher, meatier anchovies than these, ever, and the guy who deftly battered and fried these fish should be working the fryer at a Michelin-starred restaurant. Argh. I couldn’t do it. I couldn’t leave so many great meals in Istanbul represented by a mere single entry. 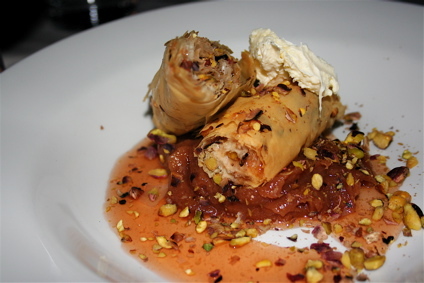 Muzede Changa, with its gracious hospitality and gorgeous outdoor terrace, served one of the best meals I ate all year, and their “updated” baklava served with clotted cream and quince puree transformed me into a baklava lover. I love breakfast, and I love Cal-Mex food. 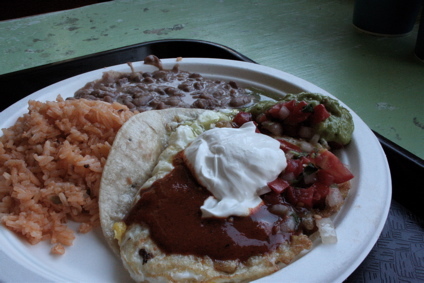 Which means that as long as it’s made hot and fresh, huevos rancheros will get me very time. Good work, Tacos Por Favor. Maybe I was homesick when I ate at Hodad’s in San Diego, but I swear they make one of the best burgers in the world. 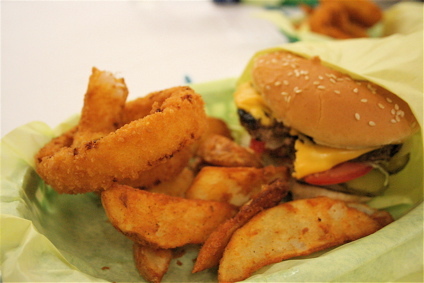 Or if not the best burger, then *definitely* the best onion rings in the world. If you don’t believe me, go there and try them yourself. It’ll be worth the trip, I promise. Though our mains at now-Costes-Brothers-owned Thoumieux weren’t very exciting, the starters there were creative, memorable, and most importantly, delicious. The wild calamari salad served with thick lardons and a soft-boiled egg (carbonara style) was both playful and uber tasty. 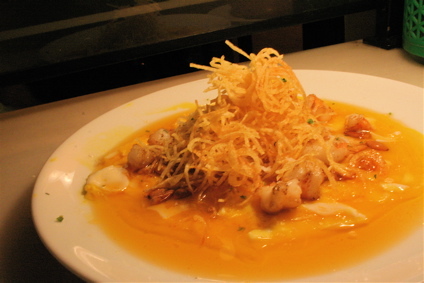 A creamy surf-and-turf. You should eat at Thoumieux for the fresh bread and starters alone, but I guarantee you’ll stay for the atmosphere and good-looking servers. 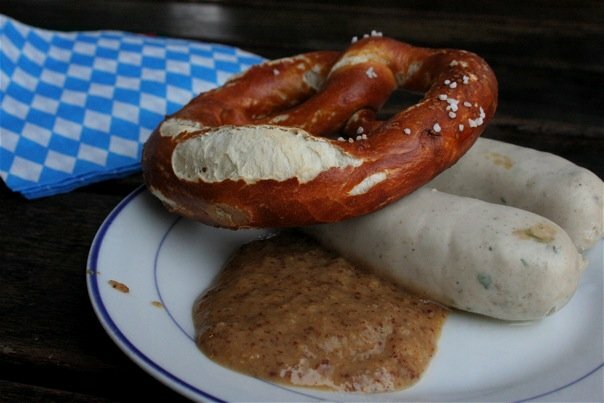 And I end the year’s list with weisswurst eaten at a cafe (Munchner Schmarkert) in Munich’s Viktualienmarkt. Who would’ve thought a boiled sausage could be so delicious? (Come to think of it, the magic mustard helps). Here’s to more travels and eating in 2010 . . . . 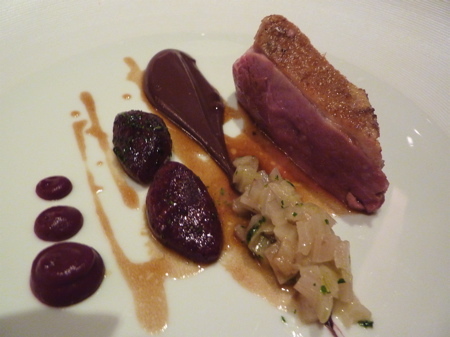 If you enjoyed reading this post, you might also like last week’s post on my favorite London restaurants in 2009. Also, for an index listing all the posts I’ve written on restaurants outside the UK (organized by country, then by city), click here.